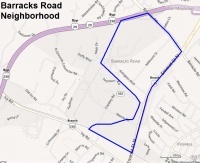 Barracks Road is a roadway in Charlottesville through the Barracks/Rugby neighborhood. The road begins in the south at Rugby Road, proceeds north to cross Emmet Street, and ends at the southern end of Garth Road. It also serves as the name of a neighborhood. Barracks is also designated as both State Route 654 and County Route 654. Barracks Road gives its name to the Barracks Road Shopping Center. The road itself takes it name from a British POW camp set up in a barracks in 1779. .
↑ Web. This Day in Charlottesville History, City of Charlottesville, retrieved March 12, 2012. ↑ Web. Improvements to Route 29 Intersection Are Suggested, Staff Reports, Daily Progress Digitized Microfilm, Lindsay family, March 11, 1948, retrieved December 12, 2016 from University of Virginia Library. ↑ Web. Competition to be high for state transportation funding, Charlottesville Tomorrow, October 18, 2016, retrieved December 12, 2016. This page was last edited on 12 December 2016, at 09:20.